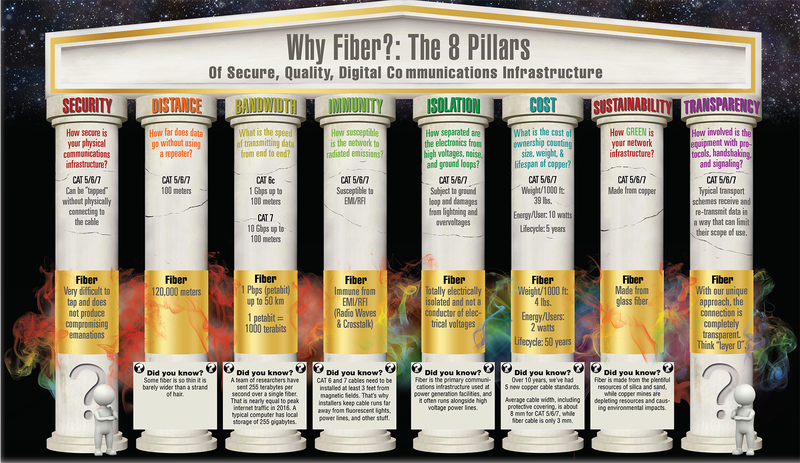 Why choose fiber? When would I use fiber instead of copper? These are common questions our clients ask. While copper and fiber each have viable roles in network designs, some folks may be less familiar with the benefits of fiber-optic cabling infrastructure. With this in mind, we have put together a summary referencing the infographic below. can be “tapped” without physically connecting to the cable. Yet fiber is very difficult to tap and does not produce compromising emanations. How far does data go without using a repeater? Ethernet over copper CAT 5/6/7 has a standard distance limitation of 100 meters (328 Feet). Fiber optic cabling can carry a signal across distances reaching up to 120,000 meters (393,701 feet). Did you know? Some fiber is so thin it is barely wider than a strand of hair. What is the end-to-end data-transmission speed? Using CAT 6c copper wiring, you can achieve up to one gigabit per second (Gbps) at distances reaching up to 100 meters (328 feet). With CAT 7 cable that data rate increases tenfold, up to ten Gbps over the maximum Ethernet distance. Using fiber, data rates skyrocket to one petabit per second (Pbps) over distances reaching up to 50 km. A petabit equals 1000 terabits. So now we have to ask: what is a terabit, right? Did you know? A team of researchers have sent 255 terabytes per second over a single fiber. That is nearly equal to the total volume of peak internet traffic in 2016. In today’s world, a typical desktop or laptop computer has local storage of 255 gigabytes. How susceptible is the network to radiated emissions? CAT 5/6/7 network cable is susceptible to electro-magnetic interference (EMI) and radio-frequency interference (RFI). Fiber, however, is immune to such electrical crosstalk, noise, and radio wave interception or interference. Did you know? CAT-6 and CAT-7 cables need to be installed three feet or more from any existing magnetic field. So that’s why installers have to run copper cable conduits a good safe distance from fluorescent lights, power lines, and any other EMI/RFI source. 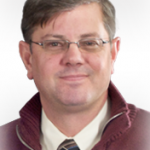 How well-separated are electronic devices and data streams from high voltages, noise, and ground loops? Copper lines (CAT 5/6/7) are susceptible to electrical ground-loop issues including lightning and overvoltage damage. In contrast, fiber-optic cable, which is made of sand/glass (non-metal), is a non-conductor of electricity. In other words, fiber is electrically isolated and immune to damage from any and all electrical sources. Did you know? Fiber is the primary communications infrastructure used at power generation facilities, and is often installed right next to high-voltage power lines. When we add up size, weight, and lifespan of copper versus fiber, what does total cost of ownership look like? Did you know? Over the most recent ten years, five new copper cable standards have emerged. Average cable width for CAT 5/6/7 (including protective covering) is about 8 millimeters. For fiber-optic cable, the average is 3 millimeters. How GREEN is your network infrastructure? CAT 5/6/7 cable is made from copper wire. Fiber-optic cable is made from strands of glass (which is made from molten sand). Did you know? Fiber is made from silica (sand)—a virtually endless natural resource. Meanwhile, copper is a finite (and diminishing) resource. Further, copper mines often cause negative environmental impact. the connection is completely transparent. We like to call it “layer zero”. So, this post is intended to summarize the advantages of fiber-optic cabling. The decision to use copper or fiber is going to depend on the details of your application. Watch for future blogs about the advantages of copper, and more analysis on what sorts of applications are better suited for each cabling type. The FiberPlex brand was established by the earliest founders of fiber optics who had a vision to transform communications. 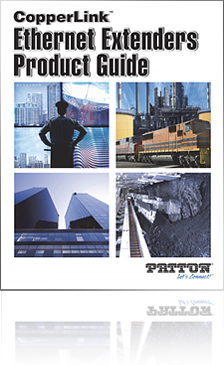 That vision has manifested and grown to reality through Patton’s new FiberPlex portfolio. Over these decades we have adapted the FiberPlex core technologies to the digital communication needs of our customers to deliver the solutions in a constantly evolving landscape. How would you descirbe the pros and cons of fiber versus copper network cabling? Tell us about your application(s)? 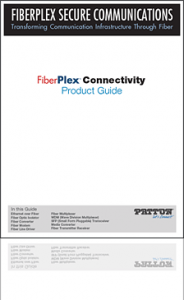 Do you need to leverage existing copper or build a more secure fiber framework? Next Post:What Can You Do with an 8-FXO VoIP Device?